The recommended Metro transit corridor (in Phase-2) to Whitefield is shown passing along the existing Airport road straight east towards Varthur, thence northwards towards Whitefield Commuter railway station. Thus, the more developed areas in Whitefield, where most tech companies, businesses & high-rise residences are situated, are not covered. It may be far more functional if this route could turn left at Karunashraya & pass through Kundalahalli cross, turn right opposite Graphite India & pass through KIADB area, ITPL & Kadugodi before aligning with Whitefield road. 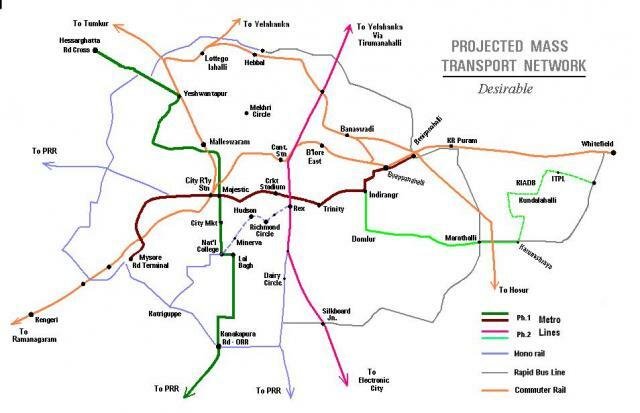 There are no direct mass-transit routes otherwise recommended to these points in the CTTP, & a TTMC proposed at ITPL may not help as commuters would need to interchange modes. 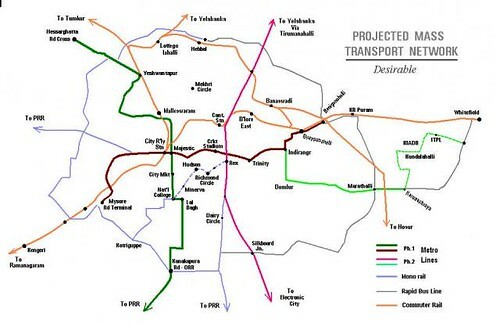 Quality seeking professionals, who are sensitive to traffic delays, detest inconveniences such as transfers, any time penalty that usually cannot be avoided when changing modes & who generally use private vehicles, commute daily to these areas, & will also start preferring the Metro with the convenience of this realignment & direct connectivity. An additional rapid bus corridor can be arranged from Marathalli /Karunashraya to Whitefield CR station via the broad Varthur road to fill the gap there as a result of this re-alignment, if volumes justify the need.